When Grave Mercy first came out, it polarized opinions and caused some very heated discussions. Some felt that it focused too hard on the romance and others were disappointed by the low number of deaths these killer nuns actually inflicted. Some, on the other hand, felt that it achieved a perfect balance between court politics, murder and romance. I myself was an immediately fell in love with the characters, all the court intrigue and the beautiful historical setting. Dark Triumph further confirmed my opinion. It was much darker than its predecessor, incredibly painful and cruel to both Sybella and the reader, but it was also heart-wrenchingly beautiful and it made me feel unimaginable things. 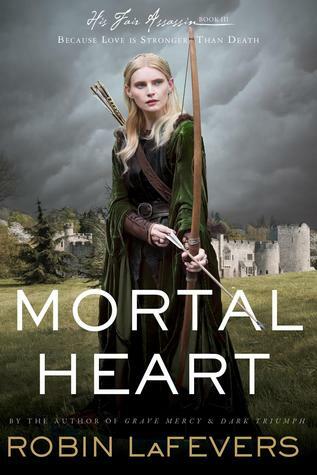 Needless to say, I dreamed of getting my hands on Mortal Heart, desperate to learn Annith’s fate. But when it finally came and when I managed to read it, the emotional impact was not at all what I’d hoped for. Alas, I found myself feeling oddly indifferent. There is nothing technically wrong with Annith’s story. LaFevers once again deserves praise for her gorgeous writing, her planning and her strong historical basis. She built an entire imaginary world around few vague historical facts and I think her idea, as well as her execution, is nothing short of admirable. I felt, however, that after all the build-up inevitably caused by the previous two books, Annith’s character lacked the necessary strength to hold everything together. I liked Annith well enough, I suppose, but compared to Sybella or even Ismae, she somehow fades into the background. For me she never managed to become more than a fairly prominent secondary character. My lack of connection with Annith caused a noticeable lack of connection with the romantic aspect of this book. Admittedly, Sybella and Beast were hard to live up to, but Annith’s romance came completely out of the blue and was far too outlandish for my taste. Once the focus shifted away from Annith, though, the overall plot was executed perfectly. I admire LaFevers for keeping everything together and planning the main plotline so well while staying true to those few historical facts. It’s quite ingenuous and it makes me incredibly excited about her future projects, regardless of how I felt about this book. As the author of my two all-time favorite reads, LaFevers firmly remains on my auto-buy list. While this book wasn’t at all what I’d hoped for, the trilogy as a whole is unforgettable and so very clever. If you haven’t already, I’d definitely give it a try. Sorry to hear it wasn't quite what you hoped for. I loved Grave Mercy and totally agree with you that LaFevers has a gift of writing. After hearing your praise for Dark Triumph I cannot wait to get my hands on it! Anyway, thanks for sharing your thoughts on Mortal Heart! Annith definitely wasn't as strong as the other two characters but I think that's why I liked her. She was still capable and all but she wasn't the overt badass that her friends were. The writing, as always, is so gorgeous. I'm sorry to hear that this was not entirely to your expectations, Maja. I loved it because I enjoyed seeing Annith's growth and her reunion with the other sisters. This is definitely a series that everyone has to revisit. Sorry to hear that you couldn't connect well with Annith. Lets see how I feel. I haven't read it so i'm pretty excited to begin it. Great review. Ugh, Maja. This book was such a disappointment. I felt exactly the same way. It's always interesting to see different opinions about the same book. It's what makes book bloggers and the blogging community fun. I really enjoyed Grave Mercy but thought Dark Triumph was just too dark for my taste. I'm looking forward to reading this one. I know what you mean, I felt this one was a bit of a let down compared to Dark Triumph. I struggled with the romance, it just didn't work for me. I still liked it over all, but it was my least fav of the series. Yeah so excited to see you listening to the Hollows. I have just skimmed through your review because I'm trying to go into the book with as little knowledge as possible about it, but I'm really sad to hear that you weren't very keen on Annith's narrative... I do hope I'll like this one more than you did, Maja! Aww, I'm so disappointed to hear that Annith's story doesn't live up to the expectation--but I can also understand that. I loooved Dark Triumph even though Grave Mercy didn't work for me and even though I'm going to be picking this one up, perhaps I'll go into it with lowered expectations. Thanks for your honest review, Maja! Aw, no, I'm sorry you didn't like this one as much! I was a pretty big fan of it but I can see what you mean about Annith. I always kind of saw her as a mystery and was eager to learn more about her so perhaps I was a bit too forgiving. The romance was indeed...unique. But I really like twists so I let that one go LOL. I didn't realize the first book was polarizing. I have several friends that share your opinion on this one though. i keep putting it off because this was one of my MUST READS and now I'm a little afraid. I'm just going to lower my expectations some and hope it's ok.